This is a screenshot using my chart on the left and sonar on the right. I have highlighted my depths on the chart using dark blue [0 to 10'], light blue [11 to 30'] and gray [31' and over]. This helps me run contours and pattern the fish for that particular day. When the water is cool and maybe cloudy I will pull boards nearby the 10 foot breakline and as the water warms the 30 foot break may produce most of our fish. You can see two waypoints I have on the chart that are on underwater points that are prime examples of where Stripers may hold. 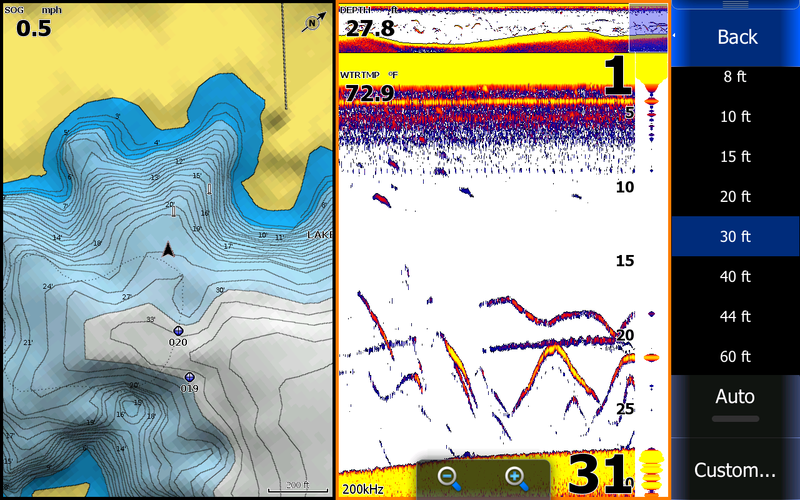 The sonar page on the right shows our bait [horizontal line] at 20 feet going right through Stripers [arches] at 22 feet. This bait didn't go far before it was clobbered. This is a good example of a rock pile that I ran over. You can tell the bottom was hard by the wide band of yellow. The down scan on the bottom right screen shows more detail of the structure but it is the side scan in the upper right that clearly shows the boulders. You can actually see a vein of rocks going out to the right side of my boat about 60 feet. 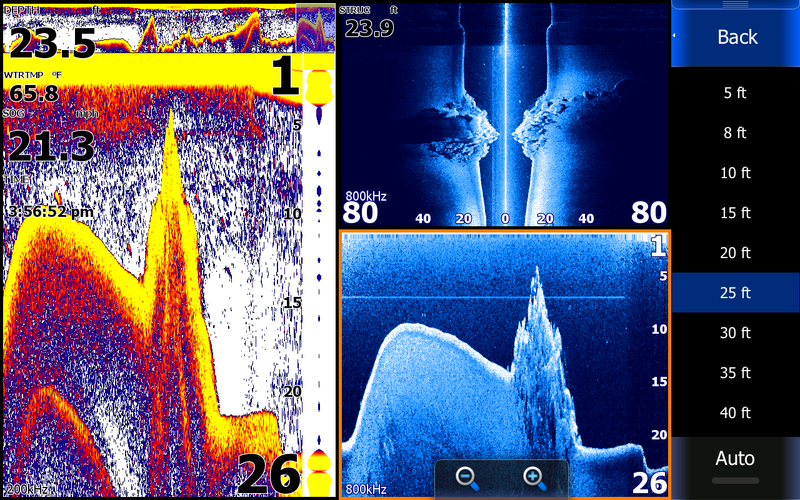 I was moving pretty fast here, the sonar shows the fish coming up on the left side of the screen about 12 feet deep where at higher speeds the down scan does not show fish quite as well. Speeds under 5mph the scan shows up better. 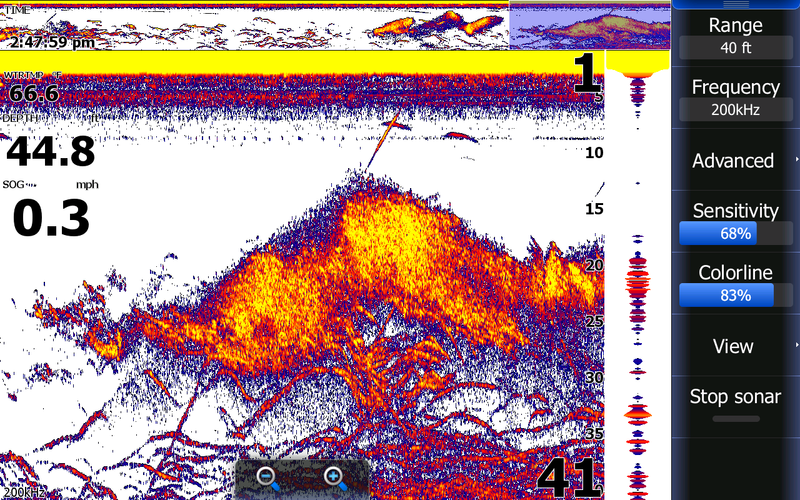 Here is a shot of my sonar showing a major school of Herring at 15 to 30 feet deep with a school of Stripers underneath the bait ball. Notice the few diagonal lines moving upward from left to right. These are fish streaking up to feed on bait. The majority of fish are simply suspending under the bait. The majority of the Stripers are not feeding in this picture and I did waist bait fishing here. If the bait was more broke up and there were many more streaking fish I would have worked it more. I did come back to the area a couple hours later and saw the bait broke up, put downlines out at 30 feet and wore the Stripers out.